I'm sorry I've been quiet lately. Truthfully, I've started a few exhaustive blog posts and then got discouraged of the amount of things I wanted to explain or detail. So, I'm just going to hit the big points. --I am taking a break from freelancing (yay!) What had consumed all of my extra time just finally ran me into the ground. Like really, really ran me into the ground--I was getting sick because of the stress I was carrying around. I thought a month off would cure it, but I finally had to be honest with myself that I needed more than that. What a relief not to be working two jobs that are both exhausting. --A has had a cough for a month and a half that won't away. She's taken asthma medicine that didn't help and finally, today she had an X-ray to learn that she has a virus in her lungs. Her doctor is thinking breathing treatments are next up. --Our house isn't put together yet because I have somehow let my pickiness spill over into home decor (surely you're not surprised though) and cannot decide where I want what. B has been a gem to paint wall after wall of pretty colors and put multiple holes in the wall until I'm finally satisfied. --Speaking of paint, we're on our fourth coat of blue in A's room. Long story short, "color match" is not as reliable as you would think, if you want a non-Lowe's paint color mixed at Lowe's, your second gallon of paint (you're painting light blue over an olive wall after all) has to be mixed in the SAME mixer at the SAME Lowe's, and if I may be so bold, it needs to be on at the SAME day at the SAME time you were in there last. Sounds extremely confusing, right? I felt like it, too when I was first told this and looked so perturbed for so long that the good paint people at Lowe's handed me two free gallons of paint just to stop asking questions like, "So, color match....I mean that should mean that they match, right?" and "No, I know it's not a Lowe's paint, but the paint color in the first gallon doesn't match the second gallon." I guess it pays to be dumbfounded. --B and I made a couple of New Year's Resolutions to make some healthier meals (living in Alabama was where I fell in love with Southern cooking), but then, I opened this present up at my parents'. And that was the end of that resolution. And I think that's it for the high points. I want to be back blogging more often. But, for now, I'm off to make this. I truly like the ripped up book on the wall. So creative! Hope the little one is feeling better soon. So sorry to hear things have been so stressful. I totally, 100% understand. You're making good decisions, though, and that will really help. Sending you, and your little one, good, healing energy. I'm glad you're taking a break from crazy stressful things! Hurray for a little (hopefully not too little) peace. 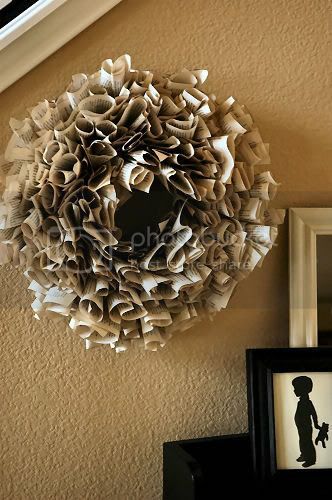 Cute wreath! I hope sweet Ava gets better soon!! How are you making that wreath? I love it! You're so cool. I want to do it, too! I do believe that 100 Years of Solitude is my favorite book ever, so I would only be sad if you had chosen it.